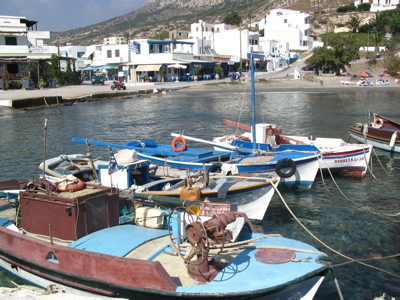 Finiki is a small fishing village located about 2 km north of Arkasa. Finiki has a reputation for having the best seafood in all of Karpathos, so you'll definitely want to pay it a visit! Make sure that you negotiate the price of the fish per kilo BEFORE eating at one of the various restaurants. Many tourists have suffered "check shock" after receiving an outrageous bill for a dinner of fresh fish. Our restaurant recommendation in Foiniki is "Marina" which is owned and run by Marina Manaroula and her family.